The very first LCHF dish we ever cooked. It has evolved through various incarnations into this very tasty, delicious dish. Oh, and I never get sick of having this for breaky. 1. 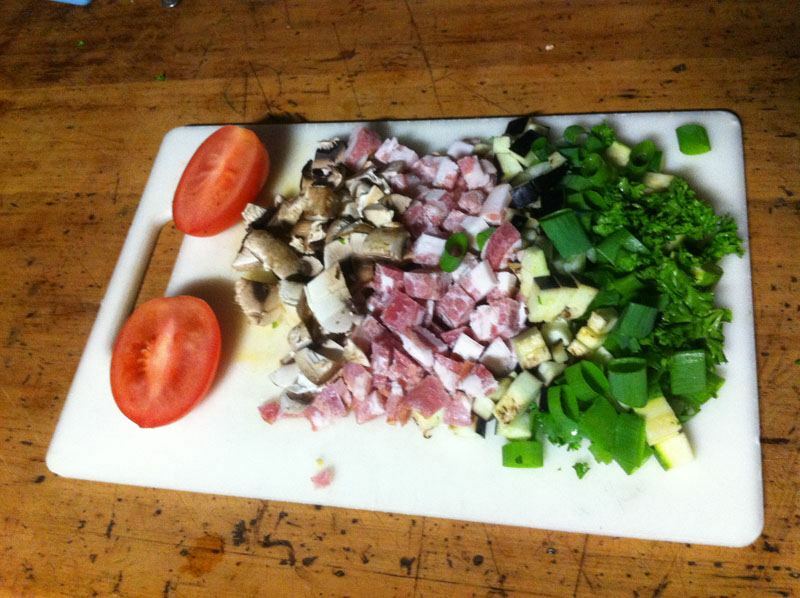 Dice, Chop and Slice the bacon, onion, shallot, parsley, zucchini, mushroom and half of the spinach leaves as thick or thin as you prefer. 2. Put your wok or frypan on a medium heat and add butter. 3. Fry up all ingredients from step 1. 4. Crack the 2 eggs into a bowl and add the cream. Whisk until combined. 5. Put your wok (or frypan) back on a low heat and add more butter. 6. Pour the whisked eggs and cream into the wok. 7. Add the fried ingredients along with the uncooked diced tomato and spread evenly over the cooking egg base. 8. Add the Jarlsberg cheese evenly over the omelette. 9. Leave to slowly cook and firm up. Using a plastic spatula, flip half of the omelette onto the other half and allow to finish cooking. 10. 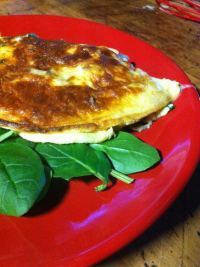 Serve on a bed of fresh baby spinach leaves. You can add anything you like to this dish, or remove anything you don't like. This morning for example (as i'm typing this recipe) I added in some finely sliced leak into the dish as we had some unused from last nights dinner. As you might be able to see, the omelette in the pictures had diced up eggplant in it. Experiment with all the ingredients you like.